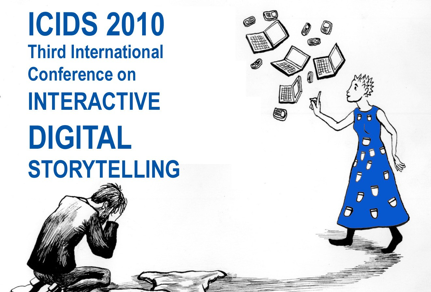 The 3rd International Conference on Interactive Digital Storytelling, in conjunction with New Media Scotland, welcomes proposals for performance and short duration installation art works that employ digital text and interactivity as their primary artistic components. Submitted works should engage computational techniques as essential in their ontology. This includes works that employ generative, interactive, networked and/or hypermedia techniques. It does not include works which could exist without the computer being involved in their production and diffusion. The performance event will be held on Halloween. The proposals may wish to engage the spirit of this festival. Submissions should include a 300 word abstract describing the conceptual, artistic and technical details of the proposed work and a separate biographical statement (no more than 300 words). The technical description should include clear indication of technical and other resource requirements, duration and space requirements. Where possible the conference will seek to ensure that the necessary equipment and resources will be available for accepted works, although this will depend on the requirements of each individual project. Documentation of the proposed work, either of prior instances of its presentation or simulations, are required. This can consist of a web page containing the material, with the URL address indicated in the abstract, or a DVD or CD appended to the proposal. The submission must be made at the full cost of the proposer. Any proposal that incurs cost for the conference will be rejected. Proposals will be reviewed by a sub-committee of the conference programme committee. Accepted proposals will, after notification, be negotiated with the proposer(s) to assure their optimal presentation and the fit of each work in the overall programme of the evening performance event. Along with a peer reviewed selection of works a small number of key practitioners in the field will be invited to present their work as keynote works.